First you need to download Launcher. You can do this my searching the app store, or from here. Open the Launcher app and click the edit button in the top right corner. If this is the first time you have opened the app, you may need to step through the tutorials first. When you have clicked the edit button, click the Add New button that shows up. This then brings up the screen shown below. Click Custom Launcher. You can even configure iViewer to launch to a specif page in your GUI, to learn about more advanced uses of the URL scheme, see this page. Choose a label for the launcher and you can even add the iViewer icon. 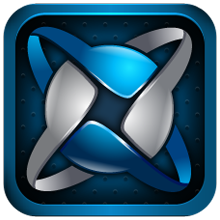 You can download a copy of the iViewer 4 icon here. Once you have entered the settings, click the tick button in the top right corner. iViewer available in the Launcher app and the notification center as shown below.